Meet my (and my kid’s) new favorite snack, sweet potato hummus. The combination of creamy, sweet potatoes and nutty chickpeas give this hummus a slightly sweet flavour, and the addition of earthy spices, like cumin, paprika, and nutmeg add a subtle pop of flavour to this savoury-sweet dip. Hummus is a perfect party snack or finger food. It offers the same creaminess of rich, dairy-laden dips, but with a much higher protein content and fewer calories. It takes minutes to prepare and lends to a variety of serving options. Classic chickpea hummus is always delicious, but it’s fun to mix things up every once in a while. My kids love hummus and eat it so often that I’m actually concerned that they might eventually get sick of it. In this case, a little bit of sweet potato goes a long way. It adds a touch of sweetness and a rich, creamy consistency. Although I prefer preparing hummus with dried chickpeas, I’m no stranger to time constraints, and so once in a while I use the canned variety. If you don’t have a tub of freshly made hummus sitting in the fridge, then you are missing out on a delicious and healthy grab n’go snack or lunch option for the family. I’ve grown accustomed to serving hummus as one of those last-minute meals on a busy weeknight, and often serve it along with fresh cheese, olives, prosciutto, and raw veggies in a no-fuss antipasto plate for the kids. Hummus is one of those ingredients that can be served with just about anything-pita wedges, raw vegetables, toasted bagels, quesadillas, nacho chips, in a healthy wrap like these Hummus Carrot Pinwheels, or even mixed into rice. The key to a smooth and creamy store-bought-like consistency all rests in one simple trick; rolling the chickpeas in a clean kitchen towel! It happened by accident, really. In my attempt to dry off the chickpeas after draining them, I discovered that the friction from rubbing them with the kitchen towel loosens the tough outer shell, which then simply falls off. Just discard and voila! Boil or steam the sweet potato for 10-12 minutes or until fork tender. Drain thoroughly. Although I prefer boiling the sweet potato, you can also heat it in the microwave for 15-20 minutes, (depending on the power setting). Just peel the sweet potato, halve it, and poke a few holes in it with a fork before putting in the microwave. Blend all the ingredients in a large food processor until smooth and creamy. If the hummus is on the thick side, add more lemon juice or chickpea liquid, depending on the desired consistency and taste preference. Garnish with a drizzle of extra virgin olive oil, paprika, and/or sumac. Yum! Hummus is one of my favourite snacks and I love sweet potatoes so I am totally pinning this for later. It looks delicious and I love that tea towel tip – thanks! Anything with sweet potato in it I’m so eating it. I love trying new Hummus dishes. So yum. My nanny kids will definitely love this recipe. Love the rolling in a tea towel tip. I usually use chickpeas in a salad or as a topping for a curry dish. However, I will have to try to make the sweet potato hummus. It sounds delicious. Rolling them in a tea towel makes it SO easy to remove the skins! I have not had Hummus in so long!! This sounds like a great recipe for it. I know my kids love anything that they can dip their food into for eating, especially if it is for their veggies. My husband is going to freak out over this recipe. He loves hummus (it is his go to dip now) and sweet potatoes. I know he will enjoy this with tortillas like you did, but have you tried it with pretzels? That is his favorite snack to use with hummus. I’ve never actually tried hummus with pretzels…but it sounds delicious! Oh my GOSH! I think this would be the only hummus my mother would actually LOVE. I really love hummus, it’s delicious and usually extremely good for you! I really like that you used sweet potatoes! I really want to try this! This is even healthier for you…sweet potatoes are packed with nutrients! You always create such wonderful recipes, that can be for babies and people of all ages. I love coming and seeing what creative and tasty looking dish you posted on your blog. This looks SO delicious! I love hummus but I’ve never thought to try it with sweet potato before. I think my kids would love it too, which is really saying something. Thanks for sharing the great recipe! 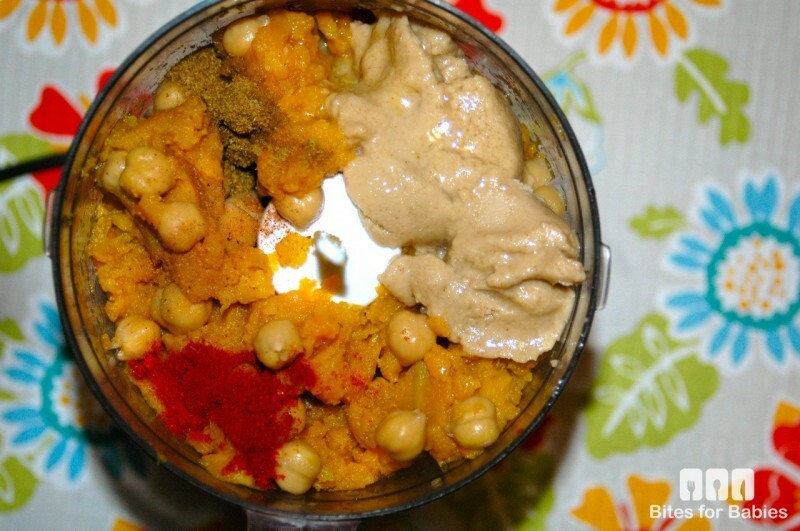 I’ve made hummus so many different ways…this is by far one of my favourites! Really? You need to try it!! I’m not a huge fan of the classic type of hummus, but this Sweet Potato Hummus sounds like something I could get addicted to! I love being able to switch things up and sneak in veggies whenever I can. Thank you for the recipe! Me too, and they always add an extra touch of flavour. Yum! This combination is really a delight to my palate. Earthy spices and a hint of sweetness are perfect tastes for comfort food. Hummus is an excellent dip! I love Hummus, but I have never tried making it on my own. I am all about healthy food and sweet potatoes are one of our favorites. I can’t wait to make this for my family. Okay, so I am a very big hummus eater, but I have never seen Sweet Potato hummus, but it looks so good that I have to try it when I go home. I love hummus so I assume I would love the sweet potato hummus. Sweet potato and chick peas sound like they would blend very well together. I’m definitely going to try this recipe. Thanks for sharing! They do…they both have a creamy consistency and a very mild flavour. I just made the hummus. It has been tasted an approved by my husband and 2 year old son. My son is still licking his lips. By far the best hummus I have ever tasted!! We love it – and so easy to make too! Thank you for the recipe! So nice to hear…thanks for the feedback! I add a few spoonfuls of greek yogurt to my hummus for a creamy taste too.